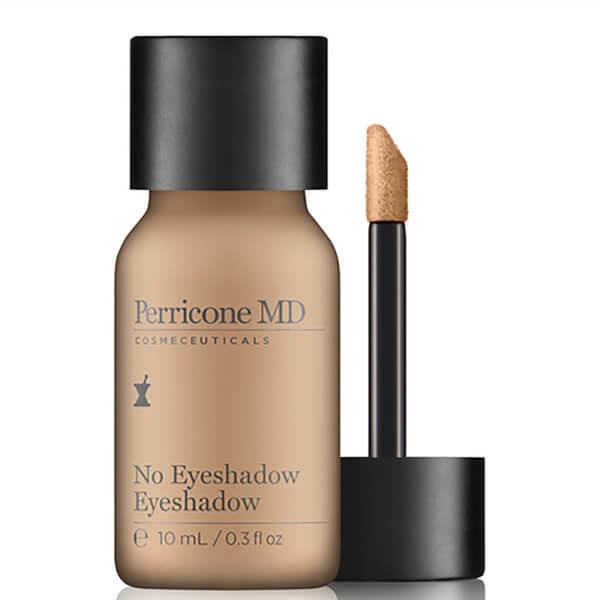 The Perricone MD No Eyeshadow Eyeshadow is an innovative serum that combines patented skincare technology with advanced makeup science; working to brighten and revitalise the delicate eye area, visibly reducing the appearance of dark spots and fine lines. Offering a universally flattering shade with light-reflecting pigments, it effortlessly glides onto eyelids and seamlessly blends in to provide natural, even coverage with a soft satin finish. Crease-proof and long-wearing, it’s been formulated with Acyl-Glutathione to deliver powerful anti-aging benefits and provide intense hydration. Perfect worn alone or used as a base primer to eyeshadow, increasing longevity. Free from fragrance, parabens, sulphates and phthalates. Shake well before use. Dispense 1-2 drops into eyelids and use fingertips to gently smooth and blend. Add one additional dot for a more dramatic effect. Water/Aqua/Eau, Isododecane, Cyclopentasiloxane, Polymethyl Methacrylate, Bismuth Oxychloride, Titanium Dioxide (CI 77891), Butylene Glycol, PEG-10 Dimethicone, Sodium Magnesium Silicate, Bis-PEG/PPG-14/14 Dimethicone, Iron Oxides ( CI 77491, CI 77492, CI 77499), Mica ( CI 77019), Dimethicone, S-Palmitoylglutathione, Glycyrrhetinic Acid, Avena Sativa (Oat) Kernel Extract, Phenoxyethanol, Caprylyl Glycol, Sodium Lactate, Tetrahexyldecyl Ascorbate, Phoenix Dactylifera (Date) Fruit Extract, Potassium Sorbate, Hexylene Glycol, Dimethyl MEA, Ascorbyl Palmitate, Disodium Stearoyl Glutamate, Hyaluronic Acid, Thioctic Acid, Ethylhexyglycerin, Aluminum Hydroxide, Palmitoyl Tripeptide-1, Palmitoyl Tripeptide-5.